Everyone who has struggled with acne knows that the battle against this skin problem does not end once the breakouts clear up. Long after the blemishes are gone, scars pop up, leaving not just brownish or reddish discoloration, but also raised spots or indentations in various sizes. Acne scars form as the skin tries to heal itself. The scars are mostly due to an inflamed lesion (papule, pustule, or cyst) that can spread into the deeper layers of the skin. It can destroy the healthy tissue of the skin, prompting the body to create an acne scar. If the acne is mild or superficial (like blackheads or whiteheads), it can heal with little to no scarring. Inflammatory acne, big pustules or severe cases, however, usually leave textural changes or scars, as they affect the skin’s deeper layers. The sad part about scars is that they are more difficult to treat than acne. Your seemingly harmless habits can also make the scarring worse or make your existing breakouts more likely to scar. Exposure to UV rays causes sun damage, which can make your skin more prone to scarring. UV exposure with no protection is also likely to darken your scar or prolong the healing process. 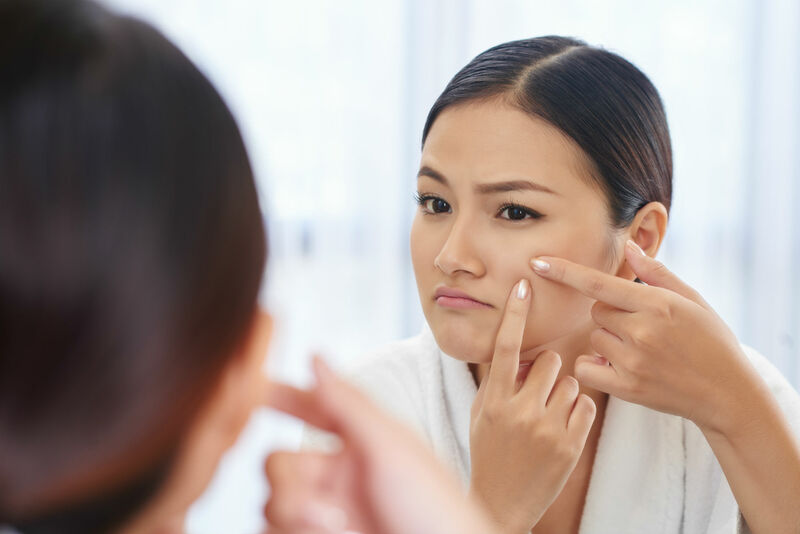 Do take note that the use of acne medication can make your skin more sensitive to sun rays, making sunscreen an essential product when combatting pimples. We recommend Clear Defense SPF 45 or Sheer Defense Tinted SPF 46 from Dr. Sylvia Skin Care. Both are non-greasy and oil-free and can protect your skin without causing breakouts. While you don’t necessarily have to skip wearing makeup, be sure to avoid putting on too much just to conceal your scars. Caking up on cover-ups like foundation can only make your scar look worse and irritate the skin. If you need to wear makeup, consider mineral makeup which has smaller particles giving better coverage without appearing cakey. Mineral makeup such as glominerals (or Glo Skin Beauty) also has a lower risk of clogging your pores which can cause breakouts. However, even if you’re using mineral makeup, you still need to make sure not to forget removing your makeup before going to bed. Although exfoliation can help fade scars naturally, overdoing it can cause irritation and make your scars worse. It can also burst existing acne, which may cause the bacteria to spread on other areas of the face. You can still exfoliate to remove dead skin, but don’t do it more than two to three times a week, especially with chemical exfoliants. Choose gentle exfoliators or consult an aesthetic doctor to learn about proper exfoliation when you have scars or active acne. 4. Popping or picking your pimples. Popping, picking, or squeezing your pimple does nothing but increase the risk of scarring and discoloration. Scratching or touching a blemish can also transfer bacteria from your hands and create inflammation. It can also prolong the healing process. Resist the temptation to pop or touch your pimple. It is advisable to apply a spot treatment cream and wait for the acne to heal. You should also consult a skin specialist to know the right treatment for your blemish. In general, acne scars in the form of light discoloration improve over time without intervention. This is not the case for indentations, as they tend to be more stubborn and less likely to improve on their own. At Cutis Laser Clinics, we offer a number of effective acne scar solutions, which include Laser Genesis and Cutera Pearl Resurfacing Procedure. This combines the power of resurfacing lasers with the gentleness and safety of non-invasive procedures to treat skin problems. It can treat uneven texture and solar damage, reduce wrinkles, and deal with acne scars (raised or hypertrophic scars). Check out this blog to learn how you can remove acne scars and pigmentation with Pearl Resurfacing. This utilizes non-invasive laser technology to safely and effectively correct uneven skin texture, diffuse redness and scars, and treat fine lines and large pores. It stimulates new cell growth and collagen production for a smoother skin, even texture, and fading of acne scarring. Keep in mind that the right treatment for you scars with depend on a number of factors. A consultation with an aesthetic doctor will help you learn more about your options. You can also read our previous blog about removing acne scars for a clearer and smoother skin. Don’t let acne scars linger any longer. Contact Cutis Laser Clinics today and schedule a consultation with our aesthetic doctor in Singapore, Dr. Sylvia Ramirez.